San Diego, CA – If you’ve been following our adventures, you know that we’ve started a project on Black Mountain with our collaborators at the University of San Diego. We’ve dedicated a significant portion of our time in California to sample preparation, and today we see the results of all of our hard work. In order to address our research questions, we need to understand the compositions of the minerals, rocks, and soils that are present at the field site. To analyze mineral compositions, we are using a scanning electron microscope equipped with an energy-dispersive detector (SEM-EDS). The electron beam interacts with a polished rock specimen to produce characteristic X-rays. The detector separates those X-rays by energy, correlates the energy to specific elements, and maps the distribution of elements in the sample. This technique allows us to determine the compositions of individual minerals in our rocks. 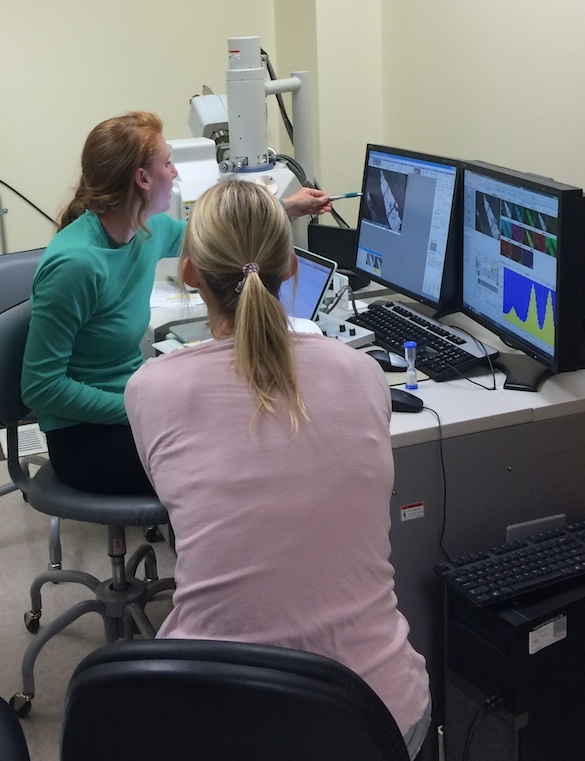 Elizabeth Johnston (USD graduate student) and Dr. Beth O’Shea (USD) are examining mineral compositions using an SEM-EDS. 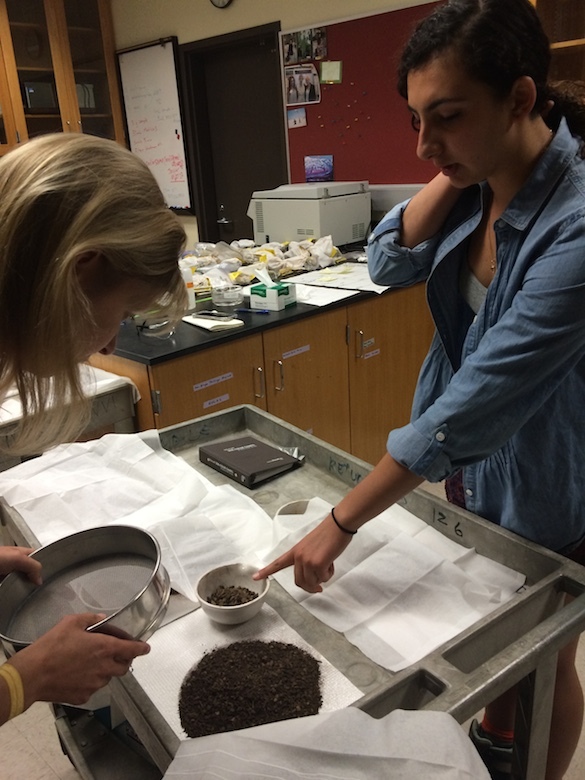 Dr. O’Shea and Amineh AlBashaireh (’18) examine soil samples and discuss analytical strategies. To analyze the bulk compositions of our soil samples, we’re using a benchtop X-ray fluorescence spectrometer (XRF). The XRF uses an X-ray beam to generate X-rays from the samples. The generated X-rays are characteristic of specific elements, which the XRF measures and compares to a calibration curve to calculate a concentration. This XRF model is equipped with several modes for analyzing soil or ore samples and allows us to analyze bulk compositions without destroying the sample. 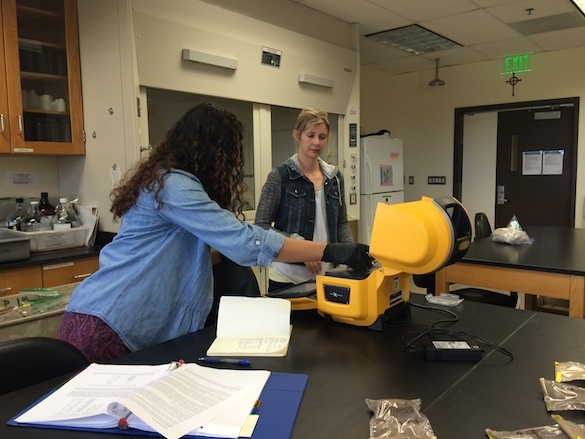 Amineh is analyzing her soil samples with the benchtop XRF. She will use these data to guide her analytical work when we return to Wooster.